The Houston Rockets’ massive new scoreboard will be the largest in an arena in the U.S. The new scoreboard will be manufactured and installed by Panasonic and will feature the largest combined viewing area of any indoor center-hung scoreboard currently used in the U.S. The scoreboard will contain four large screens — two rectangular-shaped displays that will face the east and west seating areas and a pair of square-shaped screens that will face the north and south ends of the bowl. The larger boards will measure approximately 25 [feet] high by 58 [feet] wide. The two end panels will measure approximately 25 [feet] high by 25 [feet] wide. All the boards will display a full HD signal with 1080 lines of resolution. As you can see in the mockup above, those 58-foot-long sideline-facing screens mean the entire scoreboard will stretch from lane to lane, covering nearly 62 percent of the length of the 94-foot NBA court. The Rockets' new video board is larger than a similar indoor, center-hung HD scoreboard being installed at Bankers Life Fieldhouse by the Indiana Pacers. The Pacers' new screen, which team spokesman David Benner confirmed to BDL on Tuesday, will be installed and operational in time for Indy's home opener — also slated for Nov. 3, against the Sacramento Kings — and will feature twin 21-feet-by-50-feet screens facing the sidelines and 25-feet-by-14-feet screens facing the baselines. "Hold on," you might be thinking. "If the new Toyota Center board will have 25-by-25 and 25-by-58 screens, and the genre-defining center-hung video board at Cowboys Stadium has two sides that are 29-by-51 and two that are 72-by-160, then how is this the 'largest indoor center-hung scoreboard in the United States?'" The answer lies in how you define "indoor." "The board will be the largest in an arena in the U.S. [...] the Dallas board is much larger, but we do view that as an outdoor board since it has a roof," Rockets spokesman Nelson Luis told BDL on Tuesday morning. "Our designation was for arenas in the U.S."
Regardless of whether you think the domed enclosure in Arlington constitutes an indoor space, the new big screen at the Toyota Center will represent a huge upgrade over the existing scoreboard — 600 percent more screen space, according to the team, enabling "limitless configurations for displaying live action, game statistical information and animations." In keeping with general manager Daryl Morey's emphasis on analytics, they also could bring information that cannot be found in the box scores he considers more inadequate than the old scoreboard. "Daryl and I have already talked about getting with his staff to provide more information about the way they look at the games and getting that information to the fans as well," [Rockets CEO Tad] Brown said. We probably shouldn't get our hopes too high up there — it's difficult to see Morey and his analytics team being too eager to share "the way they look at the games," since so much of what individual organizations emphasize and analyze remains proprietary and protected information — but I just flashed on the mental image of the biggest television screen I'd ever seen showcasing, say, one of Kirk Goldsberry's shooting heat maps and got really stoked. As Abercrombie told the Chronicle's Feigen, "It's really endless. It's up to our imagination how we lay out the board." The end result of that could be incredibly informative to any hoops head catching a game at the Toyota Center. While the new presentation format could produce some educational benefits, the prime thrust will, of course, be enhancing entertainment and improving the overall in-arena experience. In addition to the big screen, the Toyota retooling will include "the installation of new HD flat panel screens throughout the concourses, upgraded Wi-Fi connectivity options, new concessions point-of-sale systems and other upgrades," with a total price tag estimated at $15 million. 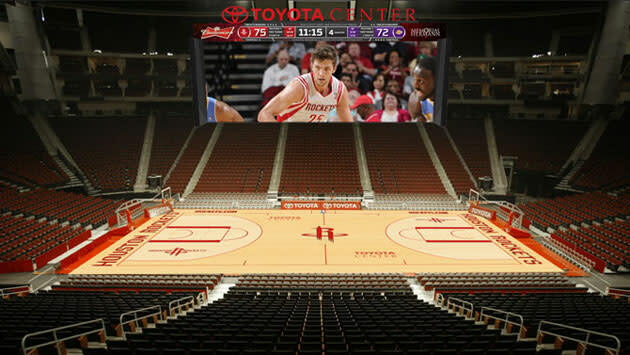 The idea, from the big screen to the concessions to the connectivity, is to create a live experience that represents a more attractive option to the consumer than just sitting at home and watching it on your destined-to-look-tiny-by-comparison flatscreen, not only for basketball fans, but also for other Toyota Center patrons, a clientele that includes concert-goers (the Red Hot Chili Peppers, Madonna, Justin Bieber and Rush will all swing through the venue on upcoming tours) and lovers of wrestling (the WWE returns in January! ), among other forms of live entertainment. As the principal tenants of the building, though, the Rockets stand to benefit most, attendance-wise, from artful deployment of the new upgrades' functionality. And for a franchise that has long finished near or in the bottom third of the league in overall annual attendance, including a 24th-of-30 mark last season, providing a more enticing in-game presentation matters ... especially if this year's young Rockets team not only misses the postseason for the fourth straight year, but takes a step closer to the front end of the lottery, as many observers predict. Having a landmark attraction above the court could help mitigate the relative lack of one on it. Either way, it's going to be fascinating to see if opponents see if they can hit the center-hanging screen, as punters did when the Cowboys opened their new Arlington digs in 2009. My money's on Dallas Mavericks coach Rick Carlisle. In addition to pure in-state rivalry, he's also shown aptitude in the kicking game in years past. NOTE: While the attendance figure cited above is accurate — the Rockets drew 506,994 fans for home games last season, good for 24th of 30 NBA teams, according to Basketball-Reference.com — as team spokesman Nelson Luis points out, the Toyota Center is the third-smallest arena in the league, which mitigates the impact of that attendance figure somewhat; after all, if your arena seats 18,043 people, you "simply can't capitalize on those nights when we could sell 21,000 or more tickets," as Luis notes. As Time's Sean Gregory recently wrote, the Rockets filled the Toyota Center to 85.1 percent of its capacity last season, which ranked 19th among 30 NBA teams, according to ESPN.com's figures.